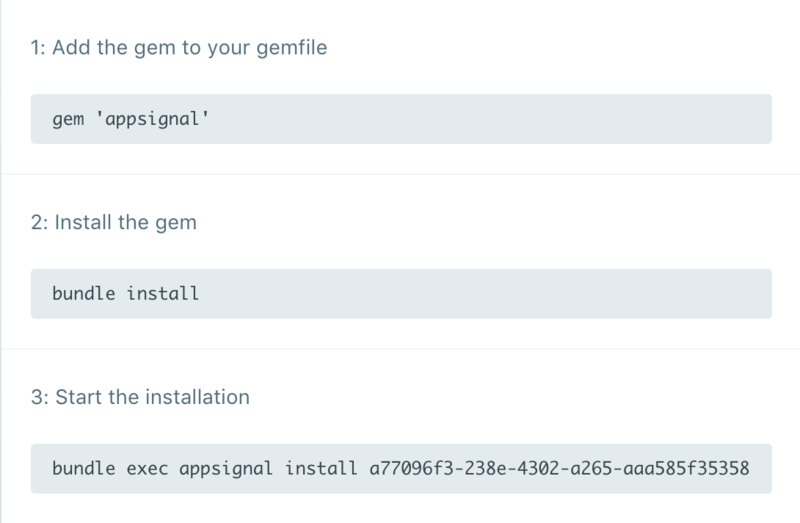 To get your app running on AppSignal you start by clicking the "add app" link on the application overview page. You will first be asked for what language you want to install AppSignal. We currently support Ruby and Elixir. After choosing a language you will see instructions on how to install AppSignal in your app. The following screenshot is for Ruby applications. The installation instructions contain all the information needed to set up including easily copy-pastable commands that contain the correct information for your specific app. Once you deploy AppSignal will start receiving data and you're good to go!